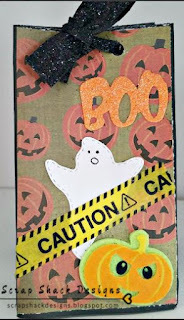 Today I have a special treat for you to help encourage you to head on over to Facebook and join a crafting swap group! These are wonderful ways to meet people, plus they allow you to send and receive some really awesome items. 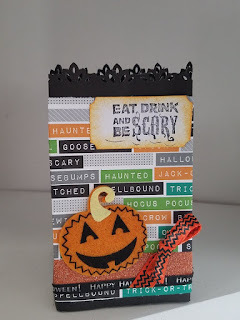 Swapper's Corner, the group I am involved with, does these large swaps called Extravaganza and last month I showed you my Autumn Extravaganza and now I am back with another one, but this time I received it. Wasn't that awesome! She put so much work into making that package that I had to share it with you guys. I mean all the way down to the little embellishments. My favorite part was how she added all of the texture. It really challenges me to look outside of the box when shopping for supplies and just really adds to the value of the item. So in short, thank you so much Julie for sending me a wonderful gift for my favorite season! Thanks for tuning in today and I hope you were inspired to create something wonderful. Today I wanted to come on and share a tip, or tutorial, of sorts. 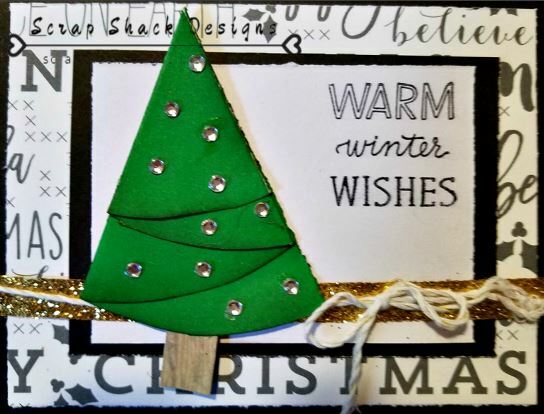 There are many different ways to add to your overall card design and we have spoken about some of them (die cutting, stamping, background techniques) but today I wanted to focus on one that helps add a little magic during the holiday season. 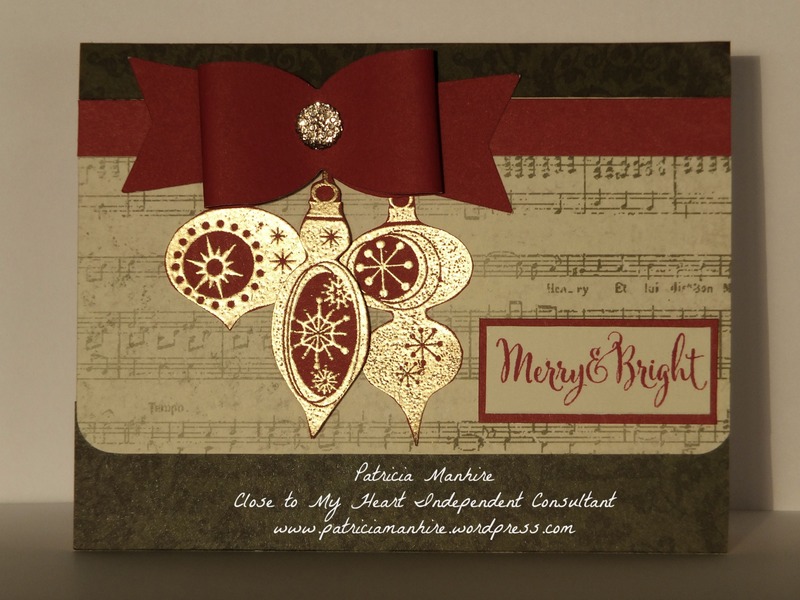 Check out these awesome projects containing a heat embossed design. 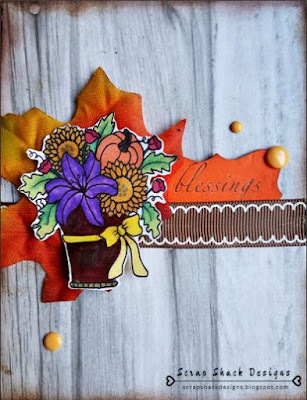 Well today I am here to talk about the Tip of the Week: Heat Embossing!! 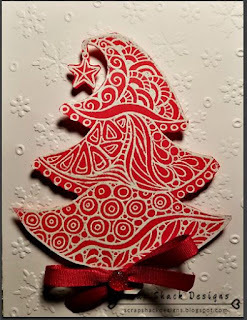 I know for me heat embossing was a love/hate relationship for a while...and then I just used trial and error so many times that I finally started to figure it out. I must admit that once you get the perfection of this technique it will transform your everyday cards...taking them from one layer to elegant in no time. 1. Prep Your Work: Use an embossing pouch, or sock filled with baby powder, to dab across your paper prior to applying the embossing powder. This helps to eliminate moisture, static cling, and any residual oils that might have left behind on the paper. To use, simply "Pounce the Pouch" (lol!) onto your surface and then apply the stamped image and powder. 2. Choose your Ink & Powder Wisely: I prefer to use Versamark Ink and a Ranger (colored or white) embossing powder, but there are plenty of ways to mix your Inks and Powder. The only rule here is that you will need both. Make sure to get a fine grit powder if you are new because it will melt faster and is easier to work with. 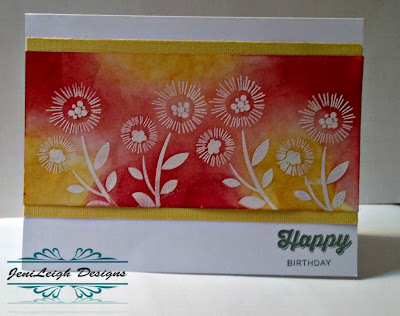 Another method is try is a Distress Ink (or any other pigment ink) and pair it with a clear embossing powder. This allows you to match your ink with your papers. 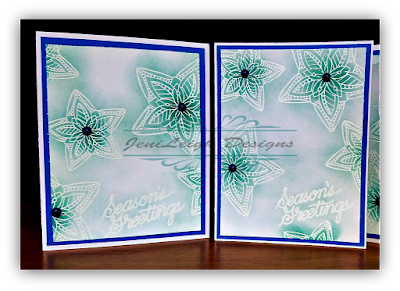 I made this card with Versamark ink along with a white pigment ink. Then I sponged my background. 2. Time For the Gun: Use a heating gun, not a hair dyer, and make sure that it is heated up and hot. Hey, you wouldn't put the cookies in your over without pre-heating right!! This will help to make sure that the paper does not burn, but that the powder will melt. Keep you gun about 12" above and keep the gun gently moving from side to side. I made a quick video a while back showing you this great technique. If you are brand new you should watch it and let me know what you think. I would love to see your cards. Thanks for stopping in for the Tip of the Week! If you have a tip you would like to share make sure to send it over to me and I will share it on our upcoming tip board. 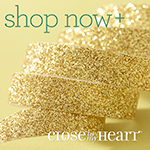 And to view all of the Embossing tools we have on hand you can shop @ My Online Store. See you next time & Happy Crafting! Hi Guys!! Thanks for tuning in today. Since I am celebrating my birthday this weekend, and because you guys are awesome, I have decided to give you something super special today. 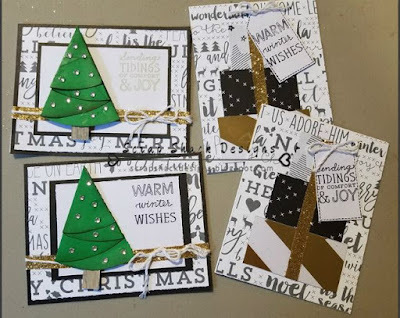 For today I have a tutorial showing you how to make not only a double page layout but also how to make 2 holiday cards!! I told you today was awesome. Here's some close up's of this layout. I used the "Silver and Gold" paper line from CTMH along with the matching complements. 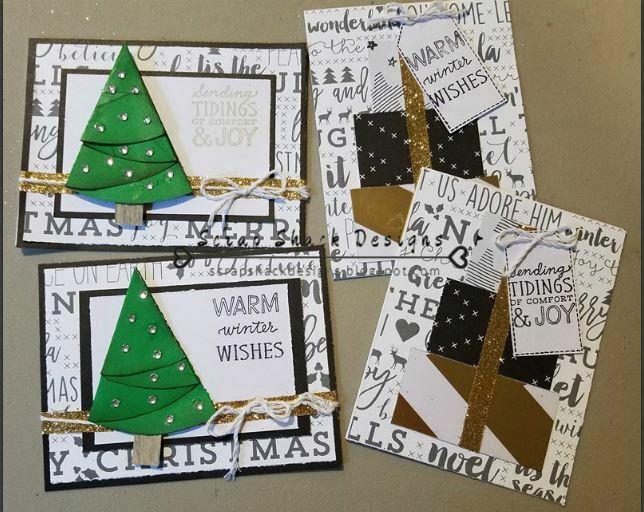 Then of course if you are a card maker I am in full swing of my holiday card making extravaganza so I decided to make 2 different cards and go live with that as well. Here are some close up photos of those cards. In the video I show you how to make this really fun and super easy Christmas tree which would be great for any holiday card. I also show you how to make this lovely present. If you missed out on the live videos make sure to head on over and give my Facebook page a like and if you're a little more hands on and wish to get great tips and deals come on over and join my VIP group. 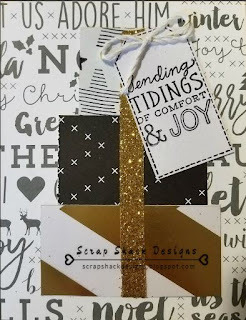 These tutorials are super awesome to use with the "Silver and Gold" paper line however can be used with any paper that you have on hand. Today I wanted to re-share a post all about achieving the perfect colored image using a single marker! 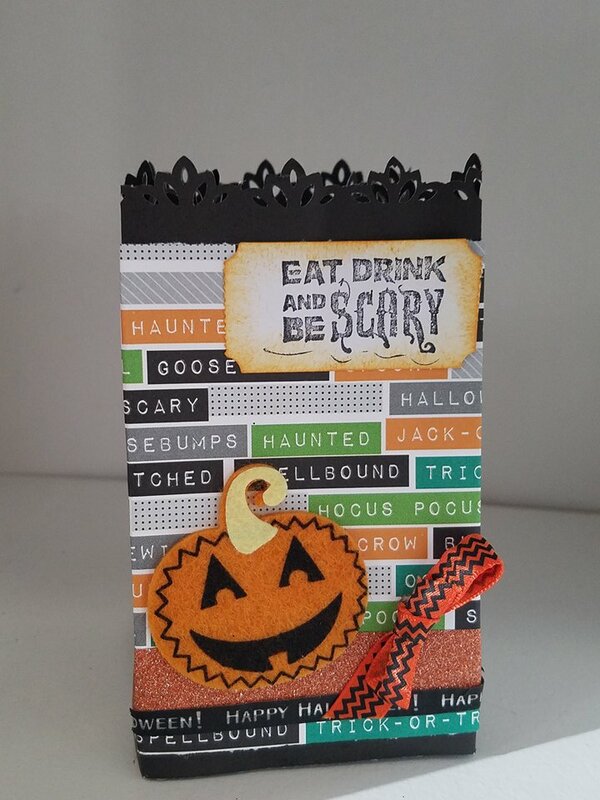 This is a fabulous technique and can bring any stamped image to life. The original article was posted over on Make It From Your Heart which is a CTMH sponsored blog. Hi Guys! 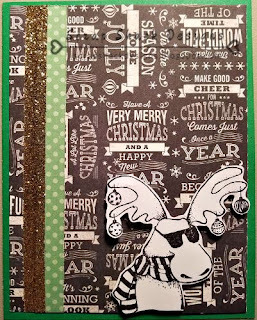 It's Jen here from Scrap Shack Designs and today I have two really fun holiday cards to share with you. So I know it's not even Halloween yet, but you can never have enough Christmas cards and that's what I am here showing off today. 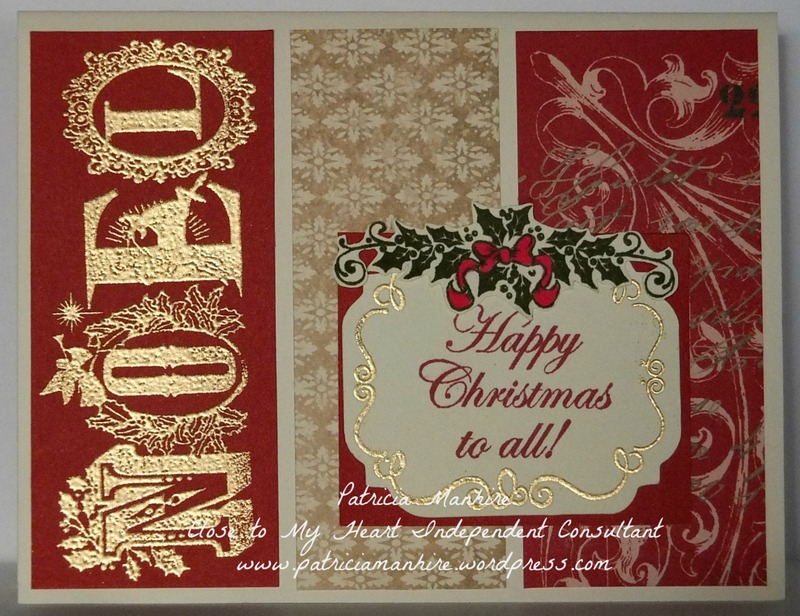 The first one was made using the wonderful stamptangle Christmas tree stamp which I decided to emboss in white. 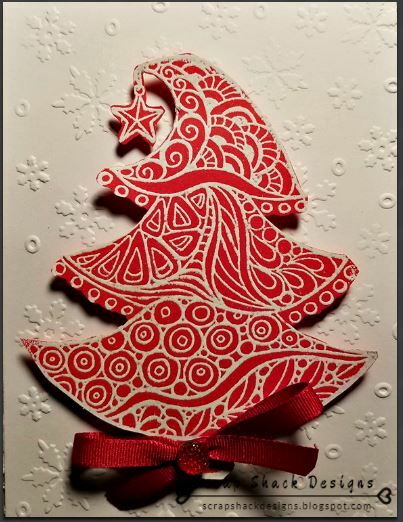 I also decided to emboss the background paper with a snowflake folder and keep the card to a simple and clean red and white color scheme. Next up I decided to go with a green background and a somewhat non traditional color scheme, using black. This fun card was kept very simple, except for the busy background. I used the Cool Yule Moose stamp which was stamped in black. I decided not to color in the stamp because again the background is very busy. Thanks for stopping in today. I hope you enjoyed these projects. Happy Crafting! As many of you know I simply love a good challenge, especially when designing my layouts, so for today's post I wanted to share my newest creation along with a brand new sketch challenge. These pictures were taken back in August when we took Moose (my youngest) out on a wonderful camping adventure. This was his first time camping and my first time back to our favorite family spot in about 3 years so there were a lot of pictures taken. I used a variety of things for this layout including complements from CTMH and a paper pack and stickers from ColorBok. The sketch came from Stuck?! which is a great source for inspiration. There challenges run all month long and the sketches are always fun to play around with. Have I ever told you that plaid is my absolute favorite pattern ever!! Well, it is and I love it more than any other one so when I received the Echo Park "Christmas Cheer" paper line I knew I would use it right up. 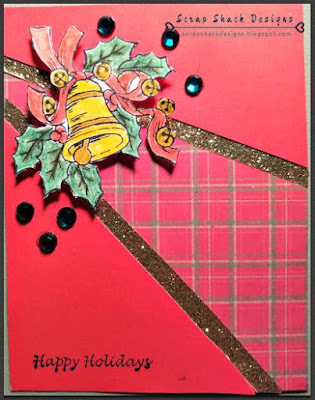 I paired this lovely plaid paper with a beautiful holiday stamp from Just For Fun, called Bells & Holly. I know that the lighting is off in this photo, blame it on night crafting and motherhood, but the gems are a fabulous emerald color and that shimmer trim is none other than the gold shimmer from CTMH. I also decided to color in that wonderful stamp with my watercolor pencils, which are another favorite. 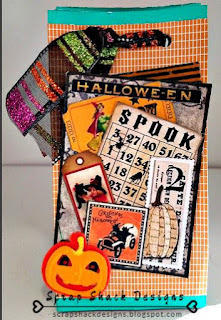 I love the layout of this card and think that it's fabulous for a bold paper to peek out through. Thanks for stopping by today. I hope you enjoyed my card and got a little holiday cheer in you. Today marks a new challenge over at Creative Knockouts where this week our sponsor is Dr. Digi and our theme is Anything Goes. Dr. Digi is generously giving one lucky winner 2 free images!! So make sure to come on over and play along. For this challenge I used Nurse Daisy and decided to pair it with some lovely papers that I received from a swap. The image was colored in using CTMH watercolor pencils which tend to give the image a more subtle look. I used a rub off sentiment and some buttons from my stash. I always feel like buttons need something in their holes so I threaded some red string through each of them. I hope you enjoyed my card today. 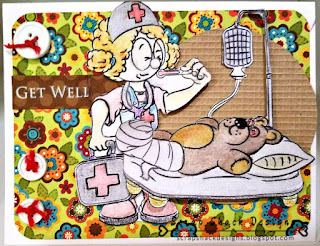 For some more inspiration come on over to CK and check out the other images from Dr. Digi and the other creations from this talented design team. 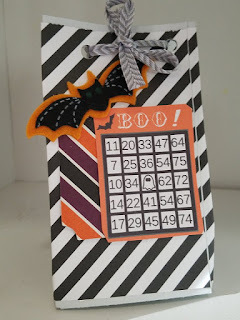 I recently had the chance to create some really fun and super easy treat bags for a Halloween Swap and at first I was not going to do it, but then we had an odd number of partners so I decided to jump right in. Now I make a ton of projects every day, but for some reason I had never tried to make a treat bag...well shame on me because these things are very easy to make and can be used for almost any occasion! Here check out the ones that I created. Now since these were the first ones I decided to keep them pretty basic. Most of the supplies come from my stash and the paper, of course, is the "Cats & Bats" line from CTMH. I have almost used up my whole stash of this paper line which is sad, but also exciting because I get to explore a new one.. like the silver and gold line I have had my eye on. By the fourth bag I was in deep and ready to explore! Try different closure systems and get creative with them. You could easily tie ribbon around them, punch a border across the top, or even us altered clothespins and binder clips!! 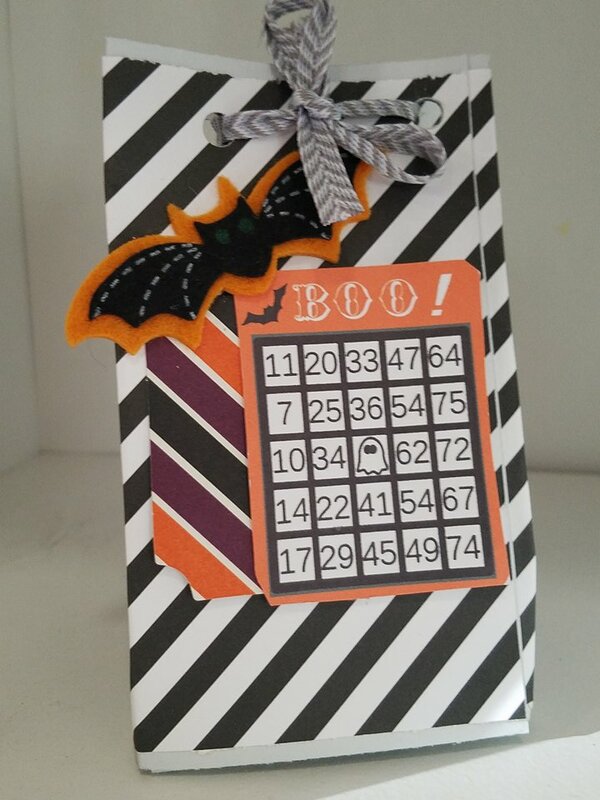 My favorite part about these treat bags is that they are a decent size, roughly 3" x 5" and two treat bags can be made per 12" x 12" paper...of course I LOVE to be frugal!! Here watch the "How-to" video below to learn how to create your own. I apologize for the abrupt end, my phone died so I had to finish LIVE on my fan-page. I'm just glad that I got the whole tutorial completed before hand. The finished bag looks like this. The possibilities are truly endless...Christmas, Birthdays, Easter, Thanksgiving Table Decor, really anywhere. 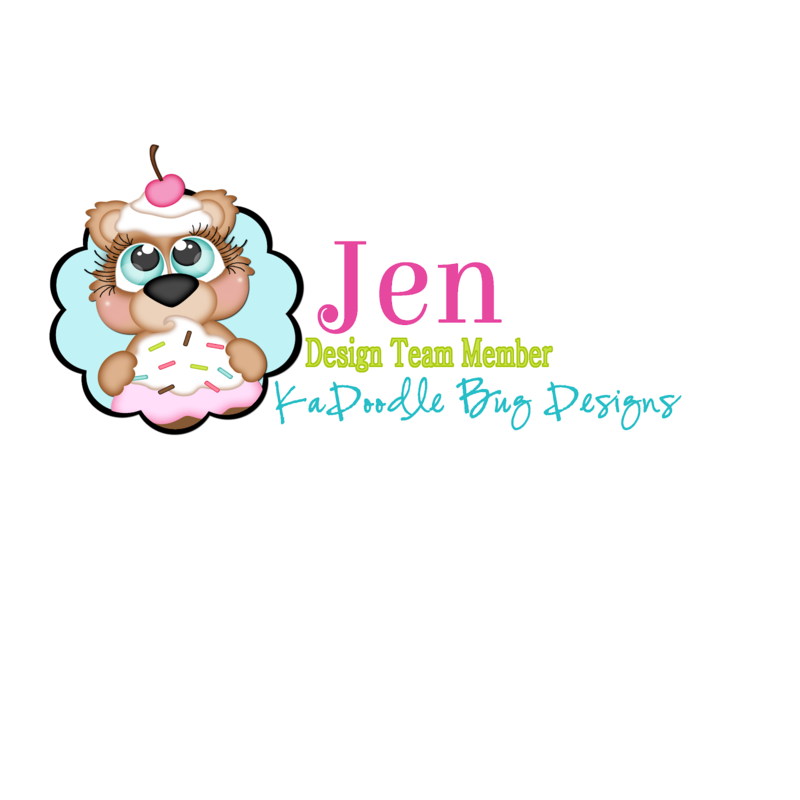 So head on out today and try to create one of these super fun, super addicting bags and then of course come join our Facebook Group and show off your creation.